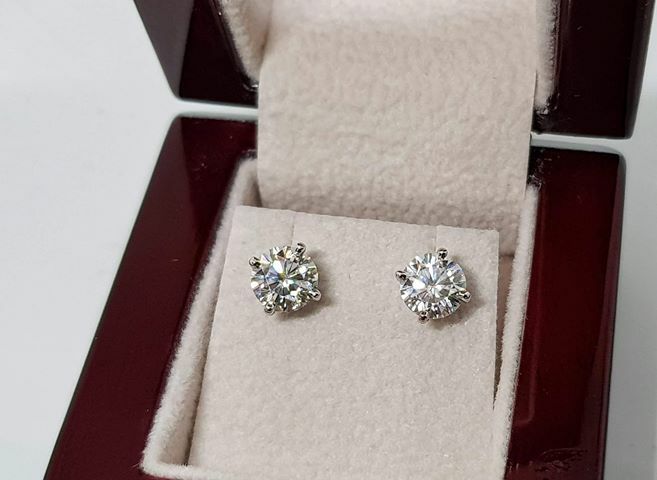 Our new optimal value/beauty brand, Phoenix Moissanite, in stunning H&A white gold stud earrings! These are our 4-prong Martini style earrings, with locking Protektor backs, in 14kt white gold. We're offering them with very limited introductory pricing of $50-$100 below their actual pricing. What we ask - if you buy at the intro pricing, please leave a review! That's the compensation to us for this incredibly low intro pricing as it will help ensure we can do volume with the Phoenix and justify the super low pricing. These are all colorless, VS+ H&A cut Phoenix Moissanite. Unlike our Amora which is optimized for maximum beauty, the Phoenix is our best value brand maximizing both value and beauty. (Example - no faceted girdles, no independent grading, no nano-polish, and H&A cut rather than Super Ideal H&A, bulk growth rather than ultra pure growth). These are made to order so please allow 1-2 weeks for us to set and ship. If you are in a rush, please check our "Phoenix Overnight Earrings" which is our inventory of ready to ship earrings that are shipped overnight allowing you in many cases to order today, wear tomorrow. So happy I ordered these! I got my earrings yesterday and boy are they pretty! So happy I ordered these.